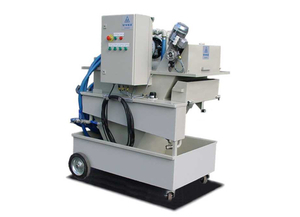 A mobile unit for purification and recycling of cutting fluids when cleaning machine sump and chips conveyor. Instead of producing waste coolant by sump sucking, the coolant in the sump is purified in Ponny unit and is used for the cleaning of the machine while the machine tools is in production. Ponny is a paper free depression drum filter on a trolley that is equipped with suction and return pumps with a complete set of hoses and suction tubes etc. The unit also includes an automatically operating tramp oil separator and sludge dewatering unit. The drum filter (DinoFilter) has an automatic system for cleaning of the filter cloth of stainless steel mesh. Throughput capacity: Up to 100 lit/min.